The default summary feed published by WordPress is 55 words. That’s not much for an enticing lead. But the worst part is that the post title is the only clickable link in the RSS feed. Even if you have self-hosted WordPress.org and use Yoast’s WordPress SEO Plugin to add a link to the post at the end of each RSS item, the posts still end abruptly with brackets and ellipses. If you choose “full text” in your WordPress Reading Settings, it will show just that in your RSS feeds: the full text of the post, including all the images and links that you put in your post. It sounds ideal, especially for the reader. But it’s not always the best choice, particularly from the blogger’s perspective. One common issue with a full text RSS feed is that it makes it a cinch for scrapers to reproduce your blog’s content on their own blog. But the second lesser known problem is that of ads and affiliate links. While many bloggers make up for the lack of sidebar ad clicks and views by including ads within their RSS header and footer, it is actually against the Amazon Terms of Service to include Amazon affiliate links within RSS feeds (the same terms are violated by including affiliate links within emails, which are often auto-generated by RSS feeds). The entire post can be consumed via feed reader: no additional clicks necessary to get the whole post. The entire post can be downloaded and read via email without consuming much data (or even read later offline). Including all the text, images, and links in an RSS feed makes much too easy for scrapers to automatically steal your blog’s content and put it on theirs. Amazon does not allow the use of their affiliate links in RSS feeds or emails. Many other affiliate programs do not allow their own affiliate links in emails. There’s no incentive to click through to your site to comment. All those readers who consume your content without visiting your site can result in a lack of ad revenue from sidebar ads that rely on clicks and impressions. If neither of the two default options are ideal, then one is forced to ask: is there a third option? And, thanks to the flexibility of the WordPress platform we know and love, there is. If you are using self-hosted WordPress.org, you can customize your RSS feed endlessly, via your theme’s functions.php folder or via a plugin. And, of course, since we’re looking for the perfect third option, it would be a plugin so that it was easy for anyone to install. 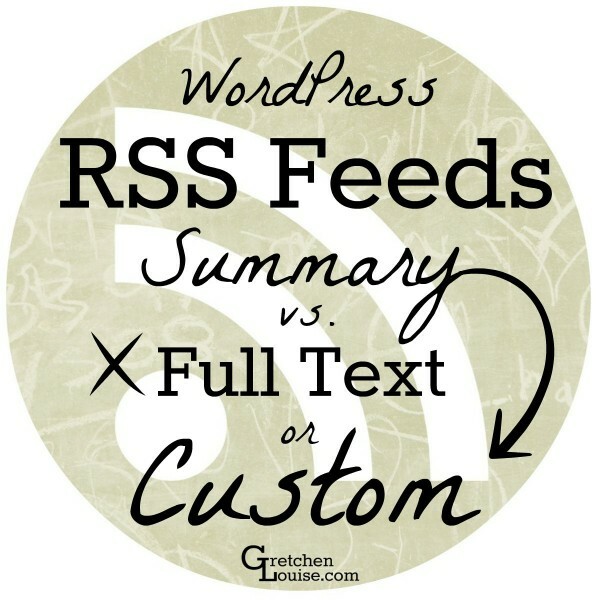 For the majority of bloggers, a custom RSS feed may very well be the perfect solution. Picture with me a simple plugin that would be that elusive happy medium for your site’s syndication. Include only the featured image, at the size you specify. Use a completely custom post excerpt, or default to the first part of your post, truncated after an approximate number of words you specify (leaving sentences intact). Not reliant on a specific feed burner or email delivery method: publish the same version to every place your RSS feed can be found. Remove all links (including affiliate links) except for the one link that points the reader to your blog to read the rest of the post. Craft your feed’s own unique call to action for the end of each post. Your readers will have to get used to a beautiful new look in your RSS feed and your posts they receive by email. The entirety of your post will only be read if the reader is truly interested in the topic. You’ll get to put your writing skills to work by creating a concise and compelling lead. Does it sound too good to be true? It’s not. Thanks to the coding skills of Robin Cornett, version 3.0 of Send Images to RSS is a dream come true for any blogger who has stayed up way too late struggling with MailChimp RSS image tags or spent sleepless nights deliberating what to do about the affiliate links appearing in their RSS feeds. She took my mess of cut and pasted code and turned my ideal wishlist into a working plugin. Thank you for the tips, Gretchen! I may give that plugin, or one like it, a try. I’m just starting to figure out this RSS business. It’s not something I used much before on my own, but I need to get a handle on it for the benefit of my site. Is there any problem of content duplication with full-text post? I’ve been Google on it about this pros & cons of RSS summary or full text thing. This article seems has declared some key points and listed them out. After read it I decided to use full text as instead of summary feed, but the weird thing is, it was set as summary but still output the full text in my WordPress site.. Thank you for this. I kept looking for something to explain this and could only find ones to talk about the regular ‘ol campaign and the RSS is the one that I just cannot make pretty. I’m off to look at that feed now and hopefully that plugin will help!